This biopic takes a look at the life of Burmese dissident Aung San Suu Kyi and her husband, Michael Aris. 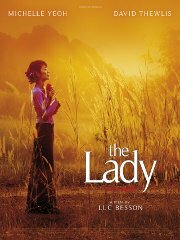 It is also the epic story of the peaceful quest of the woman who is at the core of Burma's democracy movement. Despite distance, long separations, and a dangerously hostile regime, their love endures until the very end. Comments This movie tells the true story of the fight for democracy in Burma by a brave woman against a tyrannical and cruel regime.